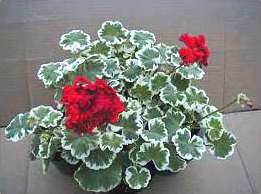 We will again begin shipping our geraniums on March 25, 2019. Each collection consists of six plants, in 4.5” pots. The six will be randomly selected out of the group listed under each collection. 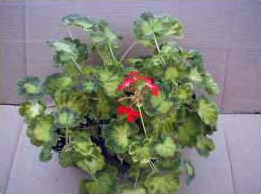 The selections will be Shady Hill’s choice, but all six geraniums will be different and individually tagged. If you would like to choose your own specific varieties, you can do that as well. Our box holds six pots, so please order in multiples of six. 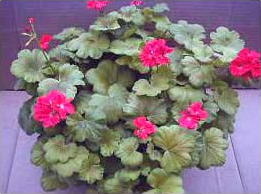 The price for each collection is $66.00 and that price includes six different, individually tagged geranium plants, grown in a 4.5” pot, plus care and growing instructions and some background information on these unique geranium varieties. FedEx 2 Day Service from our greenhouses in Elburn, IL is also included in this price. The cost for you choosing the varieties is $13.00 per pot and includes all of the items listed above. We include the price of Fed Ex 2 Day delivery in the price of each plant. Fed Ex charges for the size of the box, so the shipping cost for 2 plants is the same as for 6 plants, with the box we use. If you would like to order less than 6 plants, the cost is 14.00 for each plant, plus a 35.00 charge for shipping. After receiving your order, we will e-mail you a confirmation with a shipping date. If you have a preferred shipping date, please let us know what that is. 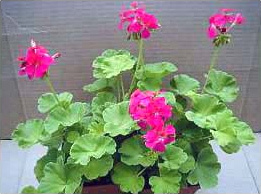 When your order arrives, it will contain growing instructions, as well as some background information on the unique geraniums that you receive. Please note that since all orders will be delivered by FedEx 2 Day Service we cannot ship to P.O. boxes. Deliveries can only be made on weekdays, so a business address is often the best option. We also ask for a signature on delivery to avoid shipments being left out in cold temperatures. This group of geraniums is known primarily for its attractive and unusual foliage, but many of the varieties have lovely flowers, as well. 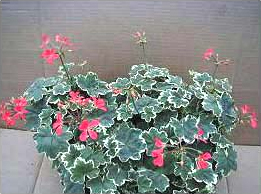 These geraniums are zonal varieties that have beautiful markings and unique leaf colors that can be as simple as a white border on the leaves while others combine chartreuse, bronze, crimson, creamy yellow. The green leaved varieties range from a pale sage, silvery green to dark forest, chocolatey green. 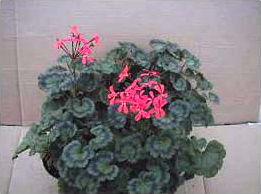 This is a deep green leaved variety with an even darker zonation on each leaf and has a salmon pink, single, lacy flower that has a somewhat European look. It is a vigorously upright plant. This variety has silver grey leaves, that are edged in white, and a single, salmon pink flower, similar to GROSSERSORTEN. It is a vigorously horizontal branching plant that is a very prolific bloomer. This variety has clear chartreuse green leaves and a single, bright violet magenta flower that is a wonderful contrast against the backdrop of the leaves. It is a free branching, bushy variety. 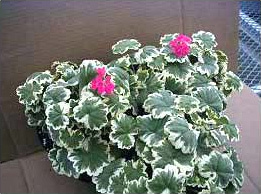 This is a cream edged, green leaf variety, with a hot pink, single flower. It is a vigorous grower that has a somewhat mounded habit. This variety has a chartreuse green leaf with an irregularly shaped darker green marking in the center of each leaf. The marking looks like brush strokes. 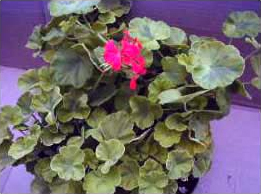 It has a corally red, single flower and grows in a mounded habit. This is a tri-colored leaf, in that is has a light green center, a darker green edge and a bronze zoning on each leaf. It has a single, scarlet red flower that is held up high above the foliage. This variety is kind of the opposite of CRYSTAL PALACE GEM, in that it has a dark green edge, and a light green center on each leaf. It has a single, cherry red flower and is one of the best bloomers of the fancies. This variety falls into the golden leaf category, but each one of the leaves has an irregular chocolate bronze in the center. OCCOLD SHIELD is somewhat unique in that it has a double flower, while most FANCY LEAF varieties are single. The blooms are a bold, corally orange shade. This variety is one of the most widely known of the FANCY LEAF varieties, because it is such a good performer. 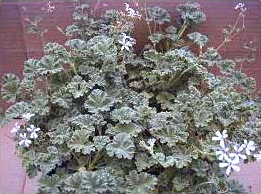 It has silvery green leaves and each one is bordered in bright white. The double flowers are scarlet red and quite a good bloomer. This is a collection that includes some FANCY LEAF, some SCENTED,as well some STELLAR and a TULIP FLOWERED GERANIUM variety. 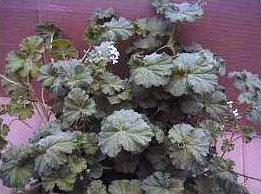 It will give gardeners a small sampling of several types of unique geranium varieties. are identified by their notched leaves and star shaped flowers, this particular variety has bi-colored pink flowers that are darker at the edges and white toward the centers and it also has chartreuse green foliage. This variety has the same notched leaves that are common to STELLAR varieties and they are a medium green color and they make a wonderful background for the pure white, snowflake like flowers. This is a TULIP FLOWERED GERANIUM and each one of the little florets that make up the blossom are shaped like a small, cupped tulip. 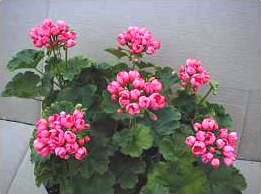 It is sometimes also called a Rosebud Geranium, but whatever the name, the uniquely shaped, salmon pink flowers are always an eye catcher. 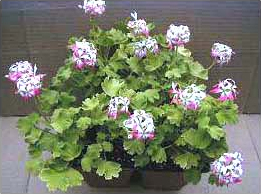 It is a vigorous grower that has dark green foliage with crinkled edges and a glossy finish. One of the most popular scented varieties because the scent is so easy to identify. This variety also works great for making a topiary standard, because it is quite a vertical grower and the small leaves will make a dense clump. One of the oldest and the most requested varieties because it has been around so very long. 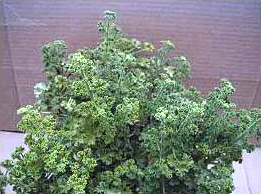 It has grey green, soft textured foliage, which is finely cut and it is a fairly vigorous grower. Pine has small, green grey leaves and a cascading habit that works well in hanging baskets, window boxes or planters. 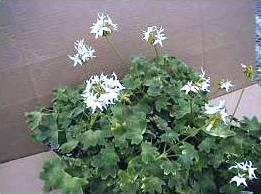 It also has prolific small white flowers. 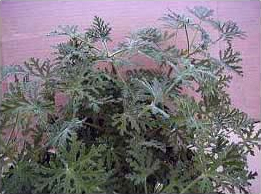 This variety has extremely fine, fern type leaves and an upright habit, as well as a pungent balsam scent. 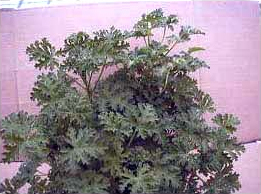 It is a vigorous grower and the fine leaves give the overall plant a unique texture. 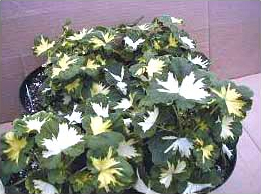 This variety has the finely cut leaves, typical of rose varieties, but the cream colored variegation along all of the intricate edges adds interest and texture to any planter. 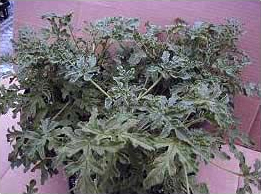 This variety has smallish, medium green leaves that are round in shape and have a serrated edge to them. The strong, citrusy lime scent is very pleasant and it will grow in a rounded habit. 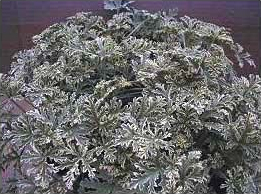 The unique feature about this variety is that the very finely cut leaves are each covered with a soft, velvety grey texture. 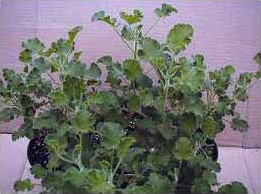 It branches quite well and has a pungent Peppermint scent, tinged with roses. This variety is a very vigorous, upright grower with somewhat cut leaves, but all of the edges are rounded, almost lobed, in shape. Gardeners will find that the strong rose scent has just a hint of lemon in it, as well. This strongly spicy scented variety has medium sized leaves that are round in shape with serrated edges. 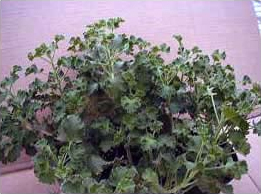 It grows in a mounded habit and has medium to dark green colored leaves.